Lobuche Peak first conquered by Ang Gyalzen Sherpa and Laurence Nielson on 25th April, 1984 is one of the spectacular mountain peaks in Khumbu Region. Residing above Lobuche village; there are two different peaks within Lobuche; Lobuche East (6,119m) and Lobuche West (6,145m) having vast crevasse between. This peak offers nearest view of top of the world Mt Everest Base camp, Kala Pathhar, Ama Dablam, Twache along with stunning view of Khumbu glacier down the line. 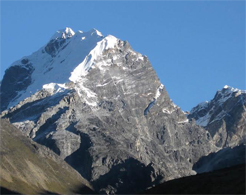 The eastern part of elevation is known for trekking whereas the Western part of elevation is recognized for expeditions. Though the peaks are linked to each other with a continuous ridge yet there is a sharp gap and considerable distance between them. Arrival in Kathmandu (1,350m/4,428ft) . Fly to Lukla (2,800m/9,184ft) then trek to Phakding (2,652m/8,700ft): 40 min flight, 3-4 hours trek. Phakding to Namche Bazaar (3,440m/11,283ft): 5-6 hours. Namche Bazaar (3,440 m/11,283 ft): Acclimatization Day. Namche Bazaar to Tengboche (3,870m/12,694ft): 5- 6 hours. Tengboche to Dingboche (4,360 m/14,300 ft): 5-6 hours. Lobuche to Lobuche Base Camp (4,950m/ 16240ft): 1-2 hours . Lobuche High Camp to Pangboche (3930m /12900 ft): 8-9 hours . * Surface transportation as per Itinerary. * Food, accommodation, salary, insurance, equipment for staff. * Experience and Government license holder climbing Sherpa guide as per group size. * Farewell Dinner in Kathmandu before departure from Kathmandu. * Personal accident insurance or Helicopter rescue. * Alcoholic beverages, hot and cold drinks, hot shower,Mineral water, laundry, phone calls, Internets. * Ice fall fees Garbage Deposit (Sharing with other member) if applicable.